I have been a daily reader of another hardware review site for years. I ready nearly every articles that headlines and find many of them quite lacking. Today I got wind of your review for the Larabee. It was very well written and produced an amazing amount of tech knowledge not really commonly reviewed. I'm glad to have found you this site, and I never create an account but today I felt obligated to. Great work. I'm glad you enjoyed the article, and this is definitely and exciting development that I think -- whether it succeeds or fails -- we will all have our eyes on. Actually crysis is the point, or a good example anyway since intel has been touting that larrabee will be something like up to 2.5 - 5 times faster than traditional present day gpu solutions. I didn't think they had been working on this for 4 years, and while it may have seemed like a good idea back then at a time when they hadn't launched a worth while product in 4 or 5 years: they just aren't that innovative. HP and intel teamed up in 94 to develop the original IA-64, spent billions in developement launching it 3 years late and making platform sales in the triple digits...total. Pentium 4! mmm...netburst, tastes like cowpie. Intel originally quoted netburst as being able to scale to 10Ghz, but they were close there weren't they? 3.8ghz is close...isn't it? It's almost half-way...besides, it doubled as a hotplate! It has taken them 5 years to reach the point of being able to essentially copy AMD's IMC design, to luanch on a chip which they licsence the x86-64 code from...AMD. Intel may do great work when it comes to designing new motherboard and networking standards (sata, Pci-e, and ehternet) but a high performance 32bit chip launched months before the consumer 64bit OS isn't an achievment in my view, so much as a reminder of the success they enjoyed in the P4 days. From a performance standpoint, it just doesn't seem realistic. The HD4870xt can surpass 1 teraflop of computations on a single 55nm die, where as Intel's $1000+ highest performing quad-core chips clock in at 38-51 gigaflops or 9.5-12.75 gigaflop per core. I'm glad Intel strongly believes they can provide a solution. Novel approaches are always welcome :)! 1. Itanium also relied (relies) on very smart compilers to produce the optimal machine code. Didn't quite happen. 2. Dynamic compilers, i.e translationg DirectX to Larrabee on the fly, can't be very smart because this translation has to run in "real time". 3. Intel seems to be heavily touting raytracing. Again, I'm glad they are doing this. But it seems to confirm that they know they can't have a sellar win by just rendering "same old DirectX" through additional layers. 1) Itanium does do certain things very very well -- it's just not the future of the desktop. 2) note that we did not use the word emulation or translation at any point -- Intel is NOT doing this with DirectX. It's just like any other API: the DirectX functions that must be implemented in a driver will be implemented in code written for Larrabee as opposed to code written for GT200 or RV770 ... Imagine some other API or even just a DLL with some functions in it -- it's all the same no matter what hardware it's written for. In some cases we'll see the actual implementation just set registers and issue a single command to the hardware to get something done. In Larrabee's case, functions to perform any complex operation will have to be called, but they are essentially doing the same thing. When I first go started on OpenGL, it was running in software. Hardware companies came along and implemented OpenGL functions in a way that used their hardware. These APIs are hardware independent (essentially). 3) the raytracing talk is, to a degree, posturing. raytracing scales well with traditional CPUs. rasterizers fit well on wide vector hardware. Larrabee happens to be both ... so ... I think they are interested in the long term. honestly, when hybrid renderers come along that combine raytraceing for specific effects inside a rasterizer we'll see some really cool things. I think this is where Intel is going. NVIDIA even showed off some hybrid tech that could run on their hardware. 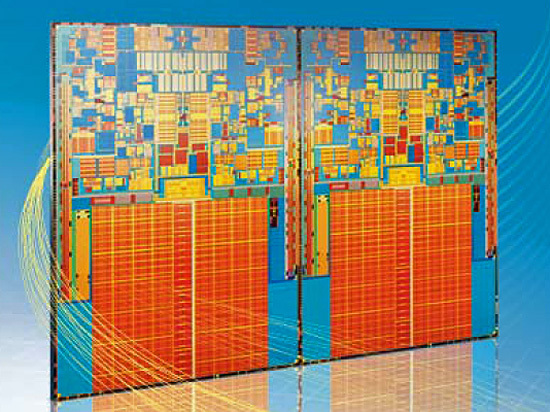 A predicted 64 core Larabee would contain 64x32KB of L1 cache and 64x256KB of L2 cache. Given a chess field configuration on silicon this lead to an abnormal die size with too much parallel leaking lines where cache coherency will be impossible or given a 4/8 block configuration which leads slower L2 cache (but this means these are not just cores sticked on silicon but rather a custom core which defeats the purpose of the project and makes this a pretty $$ solution). IMHO Larabee will probably work out but will be nothing to cheer about, probably a pushed up product that will eventually die out slowly (itanium...). The L2 cache is segmented so that each core can only directly access 256kb. The arrangement can be quite flexible because of this. Cache coherency is maintained through the ring bus. if one core needs data being used by another core, in the L2, it goes through the ring. at least that's my understanding. I apologize if we didn't do a good enough job in the article, but this isn't just a solution where Intel wants to drop stock cores on a die -- everything is custom from the scalar and vector processor upto the internal memory bus and added fixed function logic. the project has been in development for 4 years and is not meant to be cheap -- intel is putting a lot into it. by the way -- i still think 32 cores is the sweet spot for launch based on the data Intel provided -- I don't think they'll target a larger size off the bat.